The second Dyas in club ownership is still in the “refit” phase and should be ready in time for the start of the 2019 season. With this we have two identical boats with which you can measure yourself within the club as well as explore the bay together on warm summer days and learn and improve your sailing skills. The Dyas is a keelboat with trapeze and spinnaker. Despite complex equipment with many trim possibilities the Dyas is not only a sporty, fast regatta ship, but also a safe family boat and training ship for learning to sail. 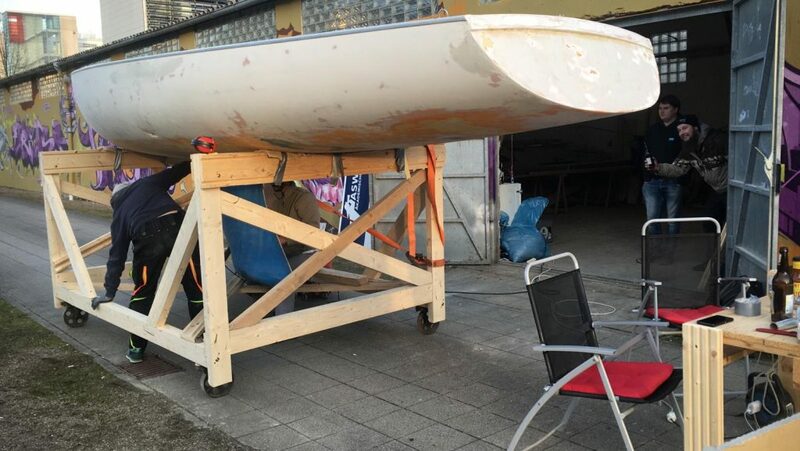 In 1970 the Dyas was designed as a two man keelboat by Helmut Stöberl (who also developed Monas, Trias, Condor 55 and Condor 70 as well as Akros and Fighter). In 1973, the German Sailors’ Association (Deutscher Segler-Verband) declared the yacht a National Class. The development as a uniform class was intended to promote sporting competition. Furthermore, the influence of the material should be as small as possible. The hull is made of glass fibre reinforced plastic (GFK), the mast and boom of light aluminium.